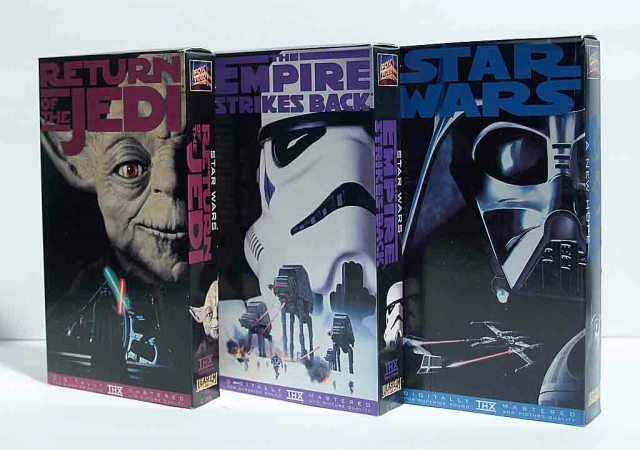 Growing up watching Star Wars marathons late in to the night with my sister Kiva, I never stopped to think whether the movies were good or bad. In fact, I never stopped to recognize that they were separate movies at all. Only later in life when I would discuss the movies with friends did I realize that people ranked the films separately. To me I couldn’t see the point in watching just one of the three, so the idea was just crazy. Our marathons happened several times each year and we never started earlier than 10pm. This was to ensure that we were properly sleep-deprived by the time we saw dancing Ewoks. We watched full-screen VHS copies of the movies, that were taped from HBO, on a 4:3 CRT television. The quality was poor and got worse with each screening due to the magnetic tape stretching more and more. Keeping the VCR remote handy for adjusting tracking was absolutely necessary. About halfway through, we would take a break to make a pot of Kraft Mac&Cheese with the dayglow powder cheese, as none other would suffice. The pot we cooked it in was so old that the teflon coating would often scrape off and we would find what we dubbed “teflon surprises” and sometimes competed to see who had the most. A full 12 pack of Mtn Dew was also required, though it did little to keep us awake due to that being our normal intake of caffeine on any other night. Kiva always made it to the end, while I developed the ability to occasionally wake up enough to react to one of his jokes so that he wouldn’t realize I was sleeping already (he always knew). This was my Star Wars experience. Then the prequels came out and while I now have my own opinions of those movies, I was one of the people who left the theater after Episode I with a great feeling. I actually enjoyed the movie because I wasn’t comparing it at all to the originals. Sure, I hated Jar Jar, but it was the first Star Wars movie I got to see in the theater when it was released. Episode I showed me a familiar world that I knew from childhood and so long as Jedi were hitting things with lightsabers and spaceships were flying around, I was overjoyed. It was at this time that I really started to realize that people had very strong opinions of the OT and the new prequels. Suddenly the innocence that I experienced with the OT was brought in to sharp focus. I came to understand that these movies did not exist only in late night sleep-deprived marathon sessions filled with Kraft Mac&Cheese and teflon surprises. Why do I mention any of this now? Nostalgia, for one. This new film brought back so many of the feelings I had surrounding the OT and in turn took me back to that innocent time. But, also because I have been reading a lot of reactions on r/StarWars that were making me feel upset until I looked at this from this new perspective. Everyone’s experience with Star Wars is totally different and unique and valid. Make up your own mind about this new episode and don’t let trolls ruin it for you. Enjoy your two hours in a galaxy far, far away and say hi to some old friends one more time.